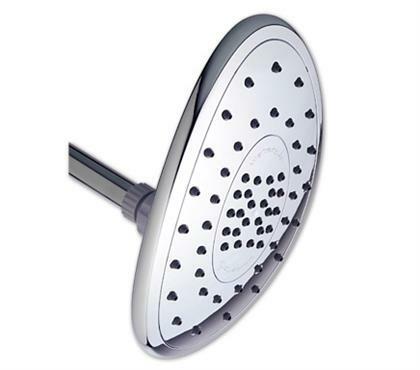 When I was doing some research of good rain shower heads to buy, I came across this one. Now I'm by no means new to the brand Waterpik, so this was going to be interesting to learn what this shower head has to offer. Before I get into that, let me tell you a little something about my reaction when I first saw it. Most of the time, the heads of these shower heads are mostly flat with various circumferences. Some are simply round, while some others are oval. This one caught me off guard because it looked like there was curvature at the face of the shower head. When i dug deeper, it turns out THAT is a unique design of this particular unit. The good news I can tell you right off the bat, is it's budget friendly. I have given multiple reviews of shower heads that costs more than 100 dollars. In this instance, you can have it for much less (i'll discuss on that later). Before I go any further, let's set some expectations. First of all, don't expect the sun and moon from things priced at an affordable level. While it is great to have good quality products at cheap prices, it tends to be an exception and not the rule. I'll break down the important aspects below so you know clearly what this shower head has to offer. First things we are going to talk about are features, the things that can possibly set this unit apart from the competition. Anti-Clog Nozzles: Our water is frequently loaded with lime and other minerals, causing build-up inside the shower head. While this is long term problem, it's a problem nonetheless. Waterpik improved their design to ensure build-up is restricted as much as possible by making each water nozzle, rubber. This not only reduces build-up over time but also makes easier to clean. If you know your area is known for having high concentration of minerals, this simple feature will help. EcoFlow 2.0GPM: Waterpik makes another version of this exact same shower head, it has a flow rate of 2.5 gallons per minute. This one on the other hand, has a flow rate of 2.0 gallons per minute, a noticeable difference as you can see. They named it EcoFlow, which in simple terms means more efficient shower head. In a nutshell, you can easily go above that flow rate by removing the flow restrictor. Curved Face for Greater Coverage: A feature unique to this model is the curved shower head. It's not everyday that you see a slightly curved face, and you may be wondering why? Simply because by doing that, the water sprays into a wider area. This is done without needing to increase the size of the shower head. Also instead of a evenly round shower head, its oval which too helps with greater water coverage. Two Settings: Look at the shower head, you can see two circles with different set of nozzles within each. This is all because of two different settings. Setting one lets you release all nozzles and experience full emersion. Setting two redirects water pressure into the center where a concentrated flow of water will come out. The latter is also a bit more high pressure because you are forcing the same amount of water into fewer nozzles. Now that we've got key features out of the way, we gotta see how we can benefit from it. That's important right? Let's fine out! Affordable: The price tag we are talking about is around 40 to 50 dollars, not outrageously expensive at all. From my research, it stacks up quite well to similar priced shower heads. In some cases, even ones costing 2-3x more have underperformed from what they are supposed to do and overall user satisfaction. Good buy! Good Coverage: As I stated earlier, its unique curved and oval design gives it great coverage. When an 8" shower head that is flat sprays water, it will be focusing only forward. However, when you "bend" it and make it curved like a spoon, you suddenly push water into outward directions. That's the beauty of this units design, simple but effective. 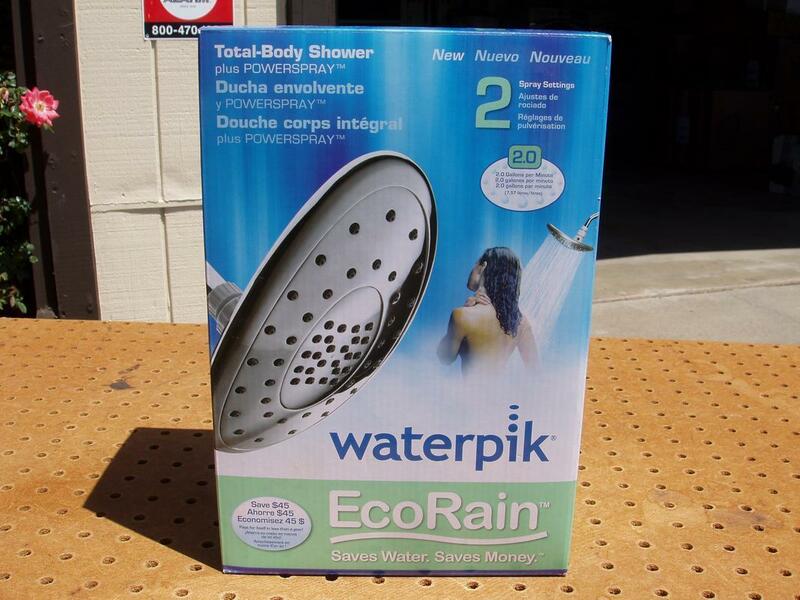 GREAT Rain Shower Head: Wide coverage plus reasonably low flow rate makes it mimic a rain shower. Especially when placed right above you with eyes closed, you can almost forget you are bathing inside the shower (until you realize you have no clothes on). You better believe there are some disadvantages with this Waterpik shower head. Below I'll mention the few that I think are important. Build Material: For the price what do you expect, metal? Nope, mostly plastic. This is a tradeoff for the price point of 40 to 50 dollars, but I won't stick to this disadvantage too long because even though its plastic... its overall a pretty good shower head. Low Water Pressure: If you have made it this far, you know by now it has lower water pressure due to its design. At your home if there is low water pressure, you can expect to have mostly mediocre flow rate. The way to combat this is to either remove the flow restrictor, or to get a completely different shower head. This point is important to keep in mind, I'd hate for you to have it all installed and end up not being completely satisfied. So what do you think, does this Waterpik AST-233E catch your eye and something you'd want to try out? When my research was complete, I was compelled to make it my next shower head. It's cheap and provides great coverage. What more could you want? Before you go, there's two things I'd like for you to do. First, if you want to compare this to other similar rain shower heads, I have a separate and dedicated page on the highest rated ones I could find. Second, if you enjoyed this review... please share it below with your friends, it would mean a lot to me.